This article originally appeared on United Politics on 13/08/2016. Duplicity and hypocrisy. Power at all costs. Cronysim. These cynical characteristics are ones that embody the typical caricature of a politician. When Jeremy Corbyn won the leadership of the Labour party, he declared a victory for a new kind of politics, focused on issues and principle and devoid of any party political point scoring, or the self-serving spin and corruption seen to have embodied the Blair era. The focus was not to be on individual politicians or parties, but on the issues that the people of this country faced and how best to tackle them. Many of his supporters backed Corbyn for precisely this reason. Fed up of PR men and women who seemed more interested in playing the game of politics to their own ends rather than actually running the country to the benefit of it’s citizens, they cheered a man who had routinely eschewed partisan issues and stuck to his principles – often in defiance of the party whip – all the way to leader of her majesty’s opposition. I confess that whilst I disagree with large swathes of his politics, I too was rooting for Corbyn to win the Labour leadership. Aside from the cynical desire to see socialism quashed in UK politics for at least another generation, politicians of principle are few and far between these days. Since taking up the role though, Corbyn has been nothing but a disappointment, proving himself to possess all those undesirable characteristics we have come to expect in our politicians. First up was Corbyn’s declaration for the Remain campaign. This represented a complete about face on his previous position. He voted to leave the then EEC in 1975, he voted against the Maastricht Treaty in 1992 and the Lisbon Treaty in 2008. His website was full of articles decrying the EU and its corporatist nature. These were subsequently removed of course, displaying the sort of behaviour his supporters saw him as the antidote to. It’s entirely possible that Corbyn did indeed reassess his view on our EU membership, though it’s much more likely this about turn was an attempt to maintain some semblance of party unity in the wake of the Trident row. Indeed, when asked why he had changed his mind, Corbyn stated that the Labour Party backed EU membership and ‘that’s the party I lead and the position I am putting forward’. So much for principle over party. The reports that in the privacy of the voting booth Corbyn checked the box marked ‘Leave the European Union’ only further demonstrated this ‘one thing in public, another in private’ casuistry of his EU position. Following the vote, we started to see the first glimpses of Corbyn’s desire to hold on to any position of power. Hilary Benn had the audacity to challenge Corbyn directly about his lack of leadership during the referendum campaign and was promptly sacked as shadow foreign secretary. Having booted the first rat overboard, Corbyn saw the rest of the opposition front bench follow suit, ultimately culminating in the vote of no confidence and leadership challenge we’re currently witnessing. Interesting comparisons have been drawn between Corbyn and Jim Murphy. The former leader of Scottish Labour won his vote of no confidence, but resigned anyway, knowing such a narrow margin made his position untenable. Even Margaret Thatcher resigned after winning the first round of her no confidence vote. Corbyn though, has opted to cling onto the leadership despite the motion of no confidence passing with flying colours, 172 votes to 40. This railing against PLP ‘disloyalty’ is made even more ironic when considering the leadership challenges Corbyn himself has instigated over the years. When he orchestrated a challenge to Neil Kinnock in 1988, the Labour leader immediately set about gaining nominations to ensure he was on the ballot and send a message, rather than hiding behind his incumbency. Corbyn, knowing he would be unlikely to secure the required nominations, has opted for the latter. 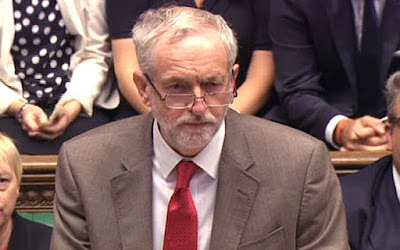 This meant a court battle, further damaging Labour’s already bedraggled reputation as an effective parliamentary force. Power at all costs? Check. And now we have the controversy surrounding Shami Chakrabarti’s peerage. Even the casual observer has noticed the ballooning problem of anti-semitism that appears to permeating Labour. But the inquiry found only an ‘occasionally toxic atmosphere’, as if claiming ‘Jews were the financiers of the slave trade’ as one activist did, was merely some political flatulence to be wafted away. Corbyn himself appeared to compare Israel to ISIS at the report’s launch. Yet Chakrabarti merely recommended members ‘should resist the use of Hitler, Nazi and Holocaust metaphors’. What appeared to be a mere whitewash has since acquired the stench of corruption. Barely weeks after the inquiry’s publication, Corbyn has nominated Chakrabarti for a peerage. This is despite last year saying ‘Labour will certainly not nominate new peers for the Lords, which risks undermining its legitimacy.’ A proper assessment of Labour’s antisemitism problem may have damaged Corbyn’s credibility as leader further still. This now looks extremely dodgy, ‘whitewash for peerages’ being the phrase bandied about. Hyprocrisy? Cronysim? Power at all costs? Check, check check. And yet why are we surprised? Corbyn has been an MP since 1983. A man spending 33 years working in the commons can quite comfortably be defined as a career politician. He allegedly divorced his ex-wife for insisting on sending their son to a state grammar school, yet he himself graduated from one. Though in fairness he only managed two E grade A levels, so one could see why he thinks they’re no good. But most of all, the man is a committed socialist. If history teaches us anything it’s that socialist governments invariably succumb to corruption, deception and authoritarianism. Corbyn’s leadership could well be remembered for the same things.